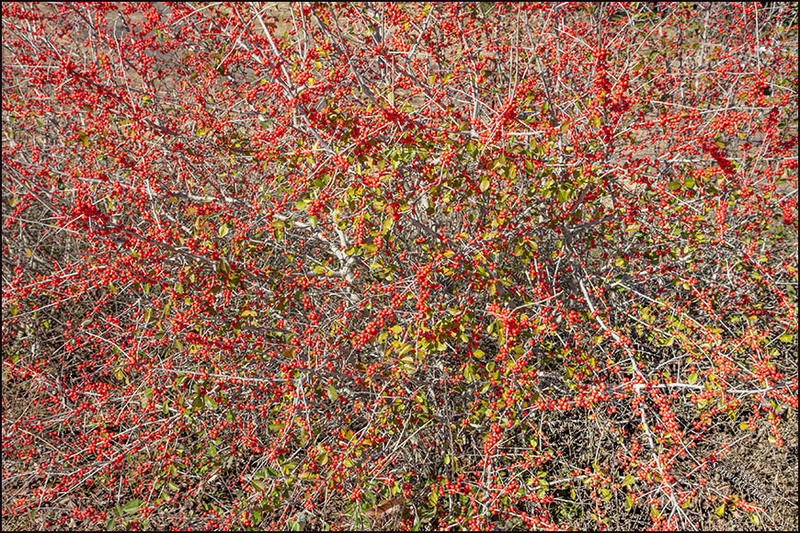 The manifold fruits made manifest in Texas by the dropping of the leaves on the possumhaw trees (Ilex decidua) toward the end of fall are a pointillist pleasure. I’ve usually waited till January each year to go out scouting for fruit along what I’ve nicknamed the Possumhaw Trail, the stretch of TX 29 between Liberty Hill and Burnet. With others’ reports and my own observations of good fruit already by late November of 2018, we did the drive on December 15th. The densest specimen we found was the one shown here a little west of Bertram. Note that while some leaves remained on the tree, they were turning pale and wouldn’t linger. Photographically speaking, this picture exemplifies point 15 in About My Techniques. Interesting effect, Steve. We have other species of holly in the north that set red berries for winter color. You can see why I go in search of these trees every year at this time. What a beautiful sight. You’re right, my mind went immediately to Ilex verticillata which were in fine fruit the last time I was there in November. The distribution maps are misleading. It is a plant of the bog, and grows in only one location in Illinois that I have found. Yes, distribution maps can be off. On the other hand, they represent reports by many people, so specimens may well exist in places where you haven’t been able to go, especially on private property. As a photographer I’ve often had the feeling of wanting to be everywhere at once, particularly in the spring. Yep, the Volo bog. There has been work to restore a small open water bog at Grant Woods, and we are hoping to reestablish Ilex verticillata there. Currently there are a few struggling tamaracks, and some leatherleaf. Yes, it is a nice little shrub of the bog. It blooms early so I couldn’t show it to you unfortunately. I don’t ever see the berries~I suspect they get gobbled up pretty quickly. Then all these bright red little possumhaw fruits can compensate you for what you don’t see on the leatherleaf. Well, a double whammy for me today in the learning department!! I have never heard of Pointillism or the Possumhaw tree. That’s an outstanding image, Steve. Well done! Then I’ll have to say double thanks. I guess by now you’ve looked up Pointillism, and today’s picture shows you the delights of the possumhaw. I see from the USDA map that some counties in central and especially eastern Oklahoma are home to possumhaws, so you might still see some. This is the best time of year because the fruit stands out on the trees’ bare branches and most other things in nature are drab. Pointillism was the first term I looked up. And I bet today the possumhaws are spectactular in Oklahoma because most of the state is getting snow! I just got back from a very taxing hike (4 inches of snow doesn’t seem like much until you trudge around in it!) and shot a few photos. Nothing bright red but lots of cardinals feeding on tall weed seeds! Too bad you couldn’t see one during your four-inches-of-snow hike, but it sounds like cardinals made for a good substitute. Down here had rain yesterday at 37° but the temperature refused to drop the extra little bit to give us snow and ice. What a beautiful stand of possumhaw. Even though we have more in this area than I’ve ever seen, I’ve not come across anything like this. I suspect if I could roam a little farther afield — especially to the north and west — I’d find more. I do like it when it’s at this stage, with some of the leaves still hanging on. There should be some dramatic shots possible a bit later in the season, as the branches become more bare. You won’t be surprised that I took plenty of pictures that day, both on and off the Possumhaw Trail. I’d taken a bunch on other days, too. While this is the densest fruit for the 2018–19 season so far, I’m also happy with some of the photographs showing less fruit, though equally red, against the clear blue of the sky. I’ve also seen plenty of young trees with small amounts of fruit, too little to entice me to take any pictures. That sounds more like what you’ve been seeing. Let’s hope a mature possumhaw all covered with fruit still awaits you. I know you’d be thrilled at the chance. By the way, the “others’ reports” mentioned in my text included yours. I am reading this on 5 January. You wrote it on 3 January. In between, 4 Jan, marks the birthday of Louis Braille and World Braille Day. https://brailleworks.com/what-is-world-braille-day/ When I saw this image, pointillism didn’t immediately come to mind, but I thought of all the little raised dots which make up Braille. If this image were tactile, I wonder if, inadvertently, the possumhaw dots would make any words. Probably not! Or they could say, Look at us. We are red and beautiful. I didn’t notice that change from Louis to Louise but I am glad you did and sent me the song Louise. I remember it from long ago and, of course, I liked it because one of my sister’s names is Louise. My grandmother was Louisa.. I really don’t know but the timing would be right. That’s a beauty of a growth. I have always enjoyed pointillism so this rocks. Amen. For me, Pointillism (New York, in college) came decades before possumhaw (here, two decades ago). Same here. I had a collection of nibs and dotted my way around sheets of nice textured paper. Long, long ago. Oh yeah…and no possumhaw in my current experience. No possumhaw, but I see that the similar species Ilex verticillata grows in every county in Massachusetts. Yeah, hollies do well here, just not that one. Now you’ve reminded me of the rock group from the ’60s, The Hollies. Possumhaw does a different kind of singing. That is a beautiful mass of fruits! It certainly is. A drive north of Austin yesterday confirmed that there are still plenty of possumhaws showing off their fruit, which brightens the land in winter here. What a beautiful, bountiful bush (or bush-like tree, at least judging by the photo). I try to imagine this scene with hungry birds, and would love to be present to witness that feast.